Our Ceramics Department is one of the oldest and most well established departments at Southwest School of Art and serves nearly 500 adult students each year in a positive, creative, community atmosphere. The ceramics program offers classes on hand-building, wheel-throwing, raku, glazing, digital embellishments and much more. Students also have the opportunity to participate and learn from visiting artists during workshops that are offered frequently throughout the year. Students registering for ceramic classes should be physically capable of lifting up to 25 lbs. Intermediate and advanced students will be required to spend time outside of the scheduled class period to load, fire, and unload kilns (under appropriate supervision). Our ceramics building features door code access. Registered students should contact the Office of the Registrar at 210.200.8217 or 8227, prior the first class to receive the current access code. Material list is either listed in the class description, will be discuss during the first class, or the materials will be supplied. This class will focus on the basic skills of wheel throwing-centering, opening, and pulling vessels-followed by learning to form bowls, cylinders, and cups. Students will also learn to evaluate form and how form serves a vessel's function. NOTE: The class will work in mid-range clay and cone 5 glazes in the electric kiln. This class will focus on the basic skills of wheel throwing-centering, opening, and pulling vessels-followed by learning to form bowls, cylinders, and cups. Students will also learn to evaluate form and how form serves a vessel's function. NOTE: The class will work in mid-range clay and cone 5 glazes in the electric kiln. No class Jul 4. Handbuilding is the fundamental construction method for creating ceramic forms whether functional or sculptural. We will be using simple handbuilding techniques to make special objects just for you. Examples of projects include daily ritual objects like a mug for your evening tea or morning coffee, catch bowls for your favorite creams, candle dishes and incense holders. NOTE: The class will work in mid-range clay and cone 5 glazes in the electric kiln. In this class, students will learn about figurative construction techniques to create a standing figure using the Greek vessel as a reference point. Students will use the coil construction technique to build a hollow form beginning with a base form and ending with a standing figure between 18 - 20 inches tall. The language of the Greek pottery vessel and its use of ideal proportions to create a belly, waist, neck, foot, and shoulder will be studied to inform the constructing of the figurative form. Students will work in a high-fire grog clay body while embellishing the surface using low-temperature glazes in the electric kiln. Prerequisite: Students must have had a minimum of two beginning level handbuilding classes. Focus on expanding and refining throwing skills while concentrating on a selection of thrown forms. Presentations and discussion will help students understand how to throw and construct vessels that integrate form with function. NOTE: Section A will focus on the casserole form by learning how the lid fits the body. Section B will focus on the complexity of the handle and how it visually responds to the vessel. In both sections students will use high-temperature clay and glazes in the natural gas kiln. Prerequisites: Students must have had at least two Introduction to Throwing classes. Looking for an alternative to brown stoneware clays? We will cover the fundamentals and intricacies of working with porcelain clay bodies for the intermediate to advanced potter/artist. Demonstrations and lectures in wheelthrowing techniques for functional work, with the addition of simple altering techniques such as, cutting, stamping, assembling will be presented to help students add personal flair to their work. We will also focus on glaze finishing techniques, and explore new/old glazes that the class will mix and use to highlight porcelain's cleaner and brighter palette in the cone 10 gas kiln firing. Prerequisite: Students should have a minimum of one intermediate wheelthrowing class. Firing images onto the surface of ceramic work opens an entirely new avenue of creative expression to the ceramic artist. Using scanners, printers, and computers, the student will learn to digitize and transfer any 2-D imagery to their work in both color and black and white. Some throwing or handbuilding experience and basic computer skills is required; photoshop experience is a plus, but not required. The instructor will demonstrate how to set up the image for the making of decals and application methods to achieve the desired result. There will be no demonstrations on how to make your work, but instead the instructor will work with each individual's skill set to produce work for the decal firing. Come to the first class with glaze fired work and dive right in. NOTE: Any work made during the class will use low-fire clays and glazes and the decals will be fired onto the work post-glaze firing. Clay and decal sheets ($14 per sheet) will be available for purchase. No class Jul 4. Students will challenge themselves to produce a coherent body of work addressing a concept or idea. Through class discussion and individual conversations with the instructor, students will learn how to carry an idea through to a physical form. The language of art, craft, and the principles of design will be used to help students make formal and conceptual decisions. These choices will be discussed, edited, and re-worked culminating in a final body of work. At the end of the session, a formal critique will be held to analyze the work produced during the session. This class is open to both handbuilding and wheelthrowing techniques, however there will be no demonstrations. See* CERAMIC NOTE. Prerequisite: Students should have a minimum of one intermediate handbuilding or one intermediate throwing class. No class Jul 4. Sandblasting techniques on ceramic forms, whether bisque ware or glaze fired, adds dimension, texture, and pattern by carving or etching the ceramic surface. A shiny glaze can be transformed into a matte finish, a glaze color can be altered by exposing hidden layers, or surface patterns created using masking-stencils. Students will work with high-temperature clay and glazes as they explore the possibilities of using sandblasting to enhance their work. Topics covered include types of masking media (liquid rubber and vinyl), hand cut and machine cut masks, types of abrasive blasting materials, and various techniques employed when sandblasting ceramics. Safety procedures and sandblasting equipment, (including blasting booths, vacuum systems and compressors) will also be covered. Prerequisites: Students must have taken at least two intermediate-level throwing classes. No class Jul 4. Combine the meditative aspect of working with clay, whether thrown or hand-built, with the calming look and sound of flowing water and-presto!-you have a fountain. Perhaps not a large ornate fountain like the Trevi in Rome, but rather a small, charming one designed and handcrafted by you for a tabletop near your comfy reading nook or another perfect spot in your home. Learn about the basic elements of a fountain (reservoir, pump, and fountain piece), the materials, supplies, and tools needed for constructing it; the essential considerations and techniques for developing the form; and, ultimately, how to assemble and maintain the fountains we make. NOTE: Students should anticipate approximately $15 for the fountain parts. This class will be working in high-temperature clays and glazes. Prerequisite: Students must have either intermediate handbuilding and/or wheelthrowing experience. Developed in China in the 7th or 8th century, overglaze painting allowed for colorful decorative patterns to be painted on top of glaze and fired at low temperatures. Traditionally done with enamel powdered pigments mixed to a workable consistency with an oil-based carrier, China painting provides an alternative way to decorate and/or layer the decorative surface of a ceramic form. Students will learn the basics of working with overglaze paints, applying the paint to a fired glazed piece, and how to layer the paint with brushes and alternative tools. Students need to bring one or two glazed pieces to the workshop. Overglaze enamel powdered pigments, oils, and brushes are included. Blue and white cobalt painting on porcelain has a long history in Chinese ceramics. This workshop will cover different historical styles of Chinese Tang, Ming, and Song dynasty cobalt painting, proper way to mix and apply, brushes, and how to use this technique in your practice. Students will need bone dry greenware, preferably flat pieces to work on. The studio will provide cobalt and brushes for students to use. Additional clay and tools are available for purchase from the ceramics studio. Please choose your class(es) and click NEXT. 0 1 Friends/Senior Tuition (65+) Attendees: 1 $ 265.00 ea. 0 1 Tuition Attendees: 1 $ 280.00 ea. 0 1 Friends/Senior Tuition (65+) Attendees: 1 $ 250.00 ea. 0 1 Tuition Attendees: 1 $ 265.00 ea. 0 1 Friends/Senior Tuition (65+) Attendees: 1 $ 270.00 ea. 0 1 Tuition Attendees: 1 $ 285.00 ea. 0 1 Friends/Senior Tuition (65+) Attendees: 1 $ 255.00 ea. 0 1 Tuition Attendees: 1 $ 270.00 ea. 0 1 Friends/Senior Tuition (65+) Attendees: 1 $ 170.00 ea. 0 1 Tuition Attendees: 1 $ 185.00 ea. Review all of the policies and guidelines below. By continuing to Step 2, you acknowledge you have read and understand the polices and guidelines outlined in Step 1. If registering during Member's Priority registration, login to the website to purchase the classes that you would like to attend. To find classes, visit the Adult Class pages. Be sure to read the descriptions before selecting your class(es). Note: Each area of concentration will have separate registration forms. If you're registering for more than one area of concentration, please follow the prompts shown in the registration form. Complete your payment information. Once your credit card payment is submitted, you will receive a e-mail with confirmation of your registration. Fiesta Arts Fair features more than 110 artists from 28 states and Canada. Talk with some of America’s best artists, listen to live music, and visit the Young Artists Garden to get the creative juju going for the whole family—all while enjoying great food and beverages in this beautiful oasis of art and history! 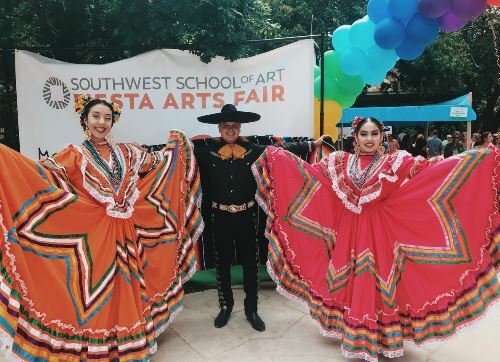 And, the fun doesn’t end when Fiesta Arts Fair is over—come back to Southwest School of Art soon and take a class or view a contemporary art exhibition—start a wonderful journey towards a life of creative expression. Would you like to keep up to date on our latest news, course offerings and exhibitions? Sign up for our e-newsletter below!